Like most Americans, from time to time I suffer from sleep problems. However, there’s one state where everyone needs a nap and a big cup of coffee, and that’s West Virginia. 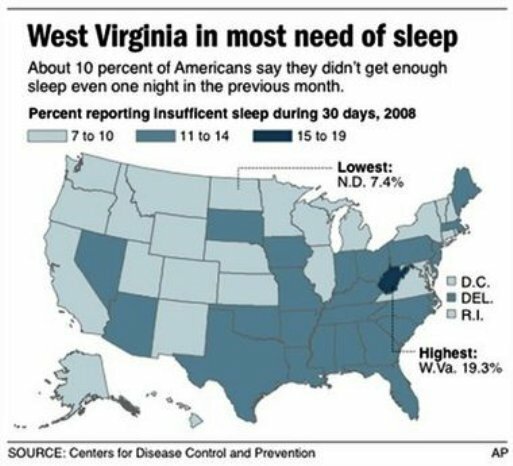 While about 10 percent of Americans say they don’t get enough sleep at night, the number in West Virginia is nearly twice that, with somewhere between 15 and 19 percent of the population report not having a single good night’s sleep in the last month. For the record, my home state of Kentucky is one of the ones that has a significantly higher rate of sleeplessness, along with Tennessee and Oklahoma. West Virginia is believed to be a perfect storm of poor sleeping conditions due to their poor diet and lack of exercise, bad health habits like smoking, financial difficulties and a high poverty rate, obesity level, and odd working hours as generated by the state’s dominant coal mining industry. It’s no wonder West Virginians have so many health problems.